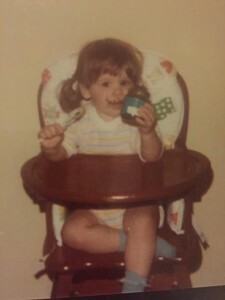 Started my icing addiction early. I’m not going to pretend I don’t love chocolate and wine. Or pizza and beer. It’s the reason I found myself needing to make diet changes in my early 20s. I just love food…all of it. I love super-healthy green kale smoothies with wheat grass and spirulina, and I love the corner pieces of cake because they have the most icing. I’m caught in this on-going state of enjoying a very healthy life that I’ve made for myself, and knowing what it’s like to stick my face in chocolate cake. To be honest, I think I’m pretty real. Aren’t most people like this? 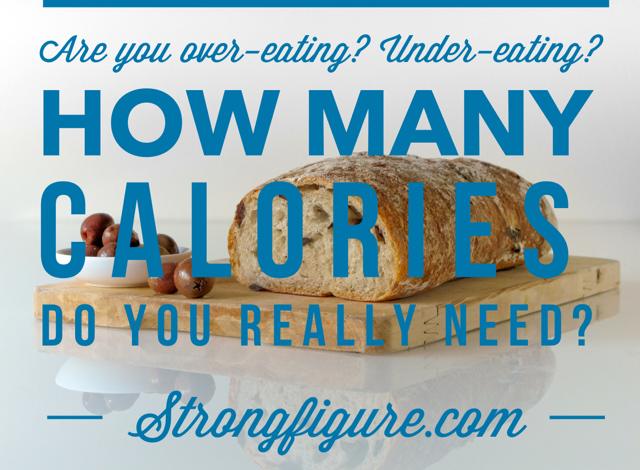 The “everything in moderation” crowd? On the flip side, I do know the people who seem unreal: they make the healthiest food decisions all the time. You know, when it’s their birthday and they skip the cake and eat Paleo ice cream. Or you’re out to dinner and they always choose the salad or the baked chicken. Or at a bar and water is the ever-go-to drink choice. I totally respect these individuals and even envy them to a degree. Why is it so easy for them? Why is wine so great? I WISH I loved chicken as much as some people do…but I eat the chicken because it’s good for me and I prioritize my health. I also prioritize my sanity. Different things work for different people. We all respond to food differently and our methods of staying on course can be very different too. Diets don’t work long term. Most people rebound with greater weight gains than when they started said diet. Following a Paleo or Whole 30 plan could be a more consistent method of eating healthy for life…if one allows him/herself a treat every so often as needed. Everyone wants to tell you how to eat. Only you can figure out what works for you–and will work long term. 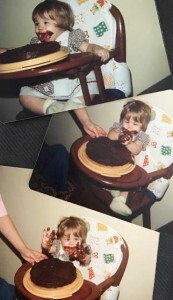 Yes, I put my face in chocolate cake. But I’ve also loved spinach since I was able to eat it by myself right out of the jar. So I like to write about food because I’ve tried it all…literally. 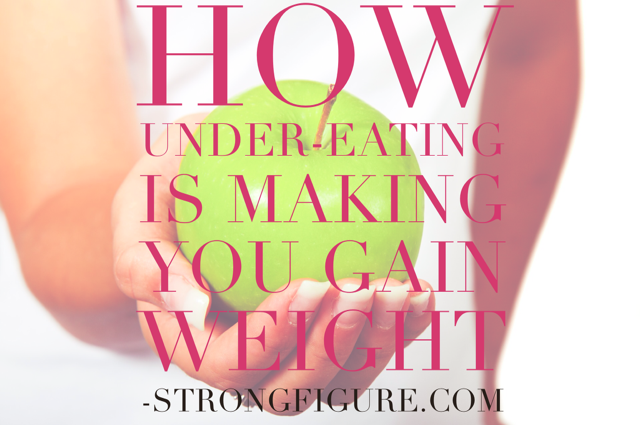 I eat anything and I’ve experimented with every way possible to lose weight. My body likes to carry weight in the hips and I’ve spent half a lifetime fighting it. I’m more accepting of it now that I’ve realized how unique every individual is and now that I’ve given birth to my daughter, I’ve come to understand my body even more. I know why my hips carry weight best, and I know what I need to do to lose that weight. I even understand and accept how challenging that is for me. No one said achieving goals is easy. If it were….well, you probably wouldn’t be reading this. BUT–you can make some choices that will allow you to feel like meeting your goal isn’t total hell. No one wants to feel like they’re on a diet all the time. That’s why diets don’t work–you feel trapped and eventually give up and resort back to old methods of eating and boom! All that hard work is instantly undone. And that’s why I write this. Because these tricks may help you. A sprinkle of dark chocolate chips can make food FUN and not like a diet. 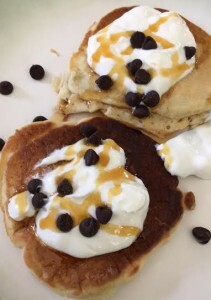 Here, gluten free pancakes topped with plain Greek yogurt, coconut nectar, and a sprinkle of dark chocolate. This was a pregnancy go-to when I was constantly craving carbs. Lifeway Chocolate Milk. Ok, it’s not organic, and I’m not saying to drink it every day, BUT it’s a chocolate milk that’s lower in sugar AND higher in protein than other chocolate milks. This can make a great post-workout treat or again, a better late night sweet-craving conqueror instead of eating something much worse. Make it even better for you by adding a scoop of chocolate protein powder or use it in a smoothie! Do you take a greens supplement at all? I LOVE Amazing Grass Superfoods but you probably know that a greens powder never tastes good. Mixing it with chocolate milk masks a lot of the grassy/earthy taste and helps you get more antioxidants into your body! Four minutes in the microwave and I’ve got veggies, sweet potatoes with cinnamon, and turkey. 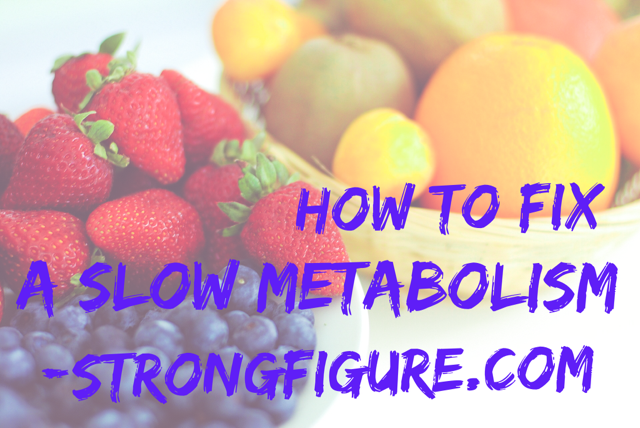 Yeah, its a processed meal, but it beats a LOT of other fast food options–especially if you’re tired of salads. And these are GREAT for brand new moms. Trust me. A one dish meal! 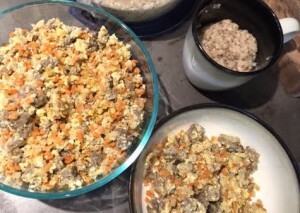 I took frozen riced cauliflower and sweet potatoes, cooked them in the microwave and then added them to a skillet of turkey sausage and eggs. Add a side of oats for baby-milk-making and Im set! Frozen Vegetables. I don’t know why frozen veggies get such a bad reputation sometimes. I think everyone believes if you’re going to eat healthy, your veggies have to be fresh. Unless they come out of your garden or you get them at your local farmer’s market or the same equivalent, frozen veggies are AWESOME. Most of the time, they can be healthier than the fresh ones. When frozen veggies are prepared for the supermarket, they come out of the farm, get flash frozen which preserves the nutrients, and then go right into the freezer. When you thaw them, they have more nutrients in them still than most “fresh” ones you’ll find. The problem with fresh produce is that you don’t know how long the veggies have been sitting on the shelf. When were they picked? How long did they travel? How long on the shelf? The longer the veggie sits, the less nutrients you get when you eat it. And now that there are so many veggie steamer bags available, eating your 8 servings of veggies a day can literally be SO easy. 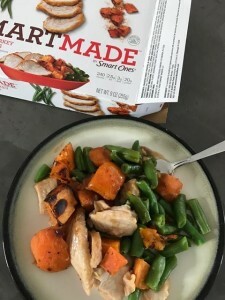 Throw a bag of spinach, brussels sprouts, green beans, cauliflower, a veggie mix, heck, I’ve seen steamable diced sweet potatoes at Wal-Mart. You CAN eat more veggies, much easier than you believe. (And if you’re one of those who HATES veggies, try the flavored steamables. It’s not as “perfect” as eating plain, untouched vegetables, but if a little garlic butter on your brussels sprouts or ranch seasoning on your broccoli helps you eat more veggies, that’s a win in my playbook. Food for a day! In the background Ive got a jar of seltzer mixed with water (half each), and a splash of “real” cranberry juice–no added sugars! What I’m saying here is that eating healthy shouldn’t feel like a chore. It doesn’t have to be boring, and you don’t need to live by super-strict rules each and every day in hopes of losing a few pounds (unless you want to, or for medical reasons have to). Eating healthy is possible when you look at food as a choice. Frozen pizza or frozen veggies? Milkshake or protein shake? Vodka tonic or seltzer and lime? If you can make the right choice 90% of the time, you can allow yourself a little sanity break 10% of the time. 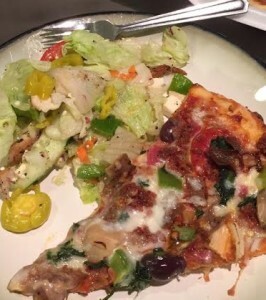 And if you can learn to make the right substitutions nine times out of ten–a homemade pizza instead of a frozen pizza or a piece of dark chocolate instead of chocolate chip cookies–then you’re getting even closer to your goals. 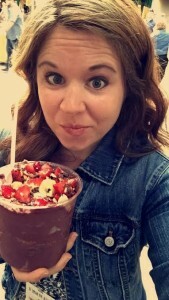 Enjoying an acai smoothie bowl topped with fresh fruit and granola. I LOVE food! 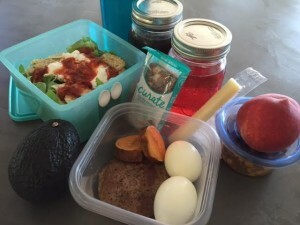 Food can be easy, simple, AND healthy if you let it. But what if this concept is brand new to you? 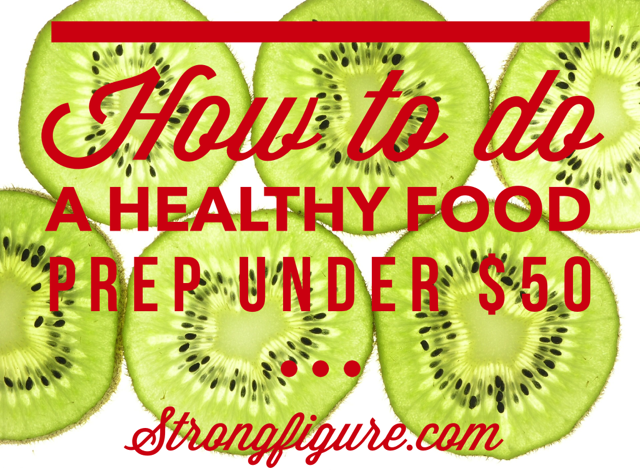 What if you’re just flat out confused on how to get started with your new healthy eating? Remember earlier when I referenced my “team” and how we could help you? Well I have a lot of hands in the fire right now, as they say. I’m so excited. (And I just can’t hide it.) 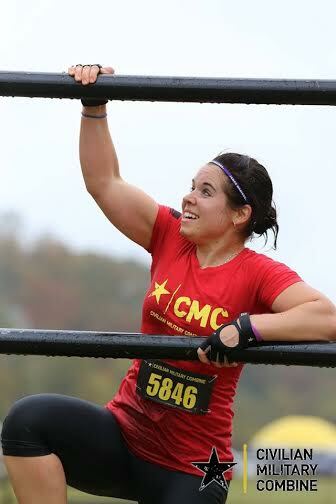 😀 Strongfigure is getting ready to launch a coaching platform. We are building a team of experienced coaches to help you reach the goals you’ve been dreaming about your whole life. 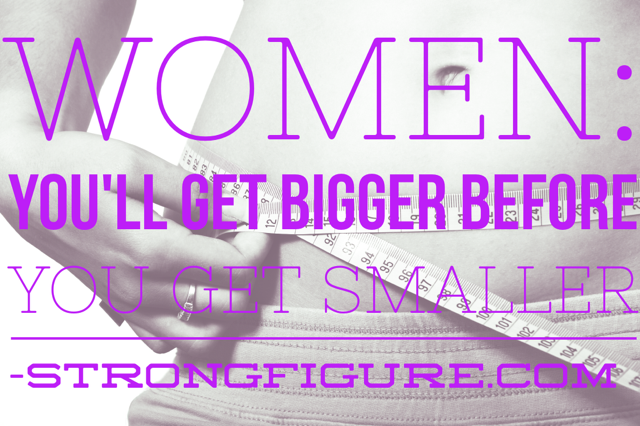 From lifting weights to losing weight, eating better and meal prepping, we’ve got it covered. Soon, you’ll be able to hire and work with the best of the best. And that’s not all. 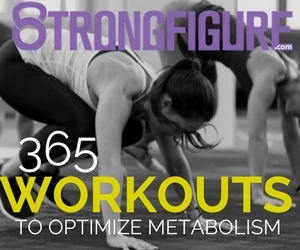 Remember our Total Health and Fitness Makeover book we published a couple years back? Well, we’ve revamped the publication. We’re in the editing and formatting stages now of our new book, under what better title than REVAMP?! Revamp takes the best of the Total Health and Fitness Makeover and we’ve added in more information that helps our reader truly accomplish big life goals. Yeah, there’s a TON of info on fitness and nutrition, but this time we’ve added more sleep tips, stress management information, confidence building education, and all the little parts that seem to be missing the most when it comes to total body wellness. While we have even more surprises coming your way, I’ll just leave it at these two for now. Make sure you’re a strongfigure subscriber so that you don’t miss out on the details of all our new projects. If you’ve got a tip that will help our readers stay the course of healthy eating while saving a little sanity too, we’d love to hear it! Share our post on social media with YOUR tip and tag us so that we see it! The tip + share with the most likes will win a PDF copy of our new book, REVAMP Your Health!